Hurricane Maria brutally exposed the crisis of Puerto Rico's colonial status. In the last ninety years, three catastrophic hurricanes have struck Puerto Rico. As a political economist who has studied Puerto Rican political and economic change, I believe Hurricane Maria could be another watershed moment that redefines United States treatment of Puerto Rico. San Felipe II killed 312 people. It left a half a million Puerto Ricans homeless and destitute, almost one-third of the island’s population. Property damage, estimated at $85 million — about $1.57 billion in 2017 dollars — was unprecedented. According to the Red Cross, no sector of the economy was “left in a worse plight” than the coffee farms. Plantations lost almost their entire crop, and Puerto Rico never regained its prominence as a coffee exporter. At the same time, San Felipe II led to increased opposition to US colonial rule. The Nationalists and the Union Party emerged as vocal critics of US colonial policy. Many Puerto Ricans portrayed the federal government’s response to San Felipe II as charity that failed to alter the regime of colonial rule and absentee capital — the root of Puerto Rico’s misery. The creation of the Puerto Rican Emergency Relief Administration was an important change in US colonial policy. The scale and severity of Puerto Rico’s humanitarian crisis was beyond the capacity of the charity-focused, volunteer approach of the Red Cross and other organizations. A federal agency had stepped in. Calls for independence escalated. Puerto Ricans denounced the corrupt colonial administration that opposed the federal agency, blocked land reform, and was solidly in the pocket of the absentee corporations. Labor strikes broke out throughout the island, and often turned violent. The colony was on the verge of collapse. The magnitude of human loss that Hurricane Maria has inflicted is still unknown. As of this writing, the official number of Puerto Ricans killed by Maria stands at sixty-four, but the New York Times released a report this week putting the number closer to 1,052. Moody’s Analytics estimated property damage at $55 billion, and projected a $40 billion loss in economic output. 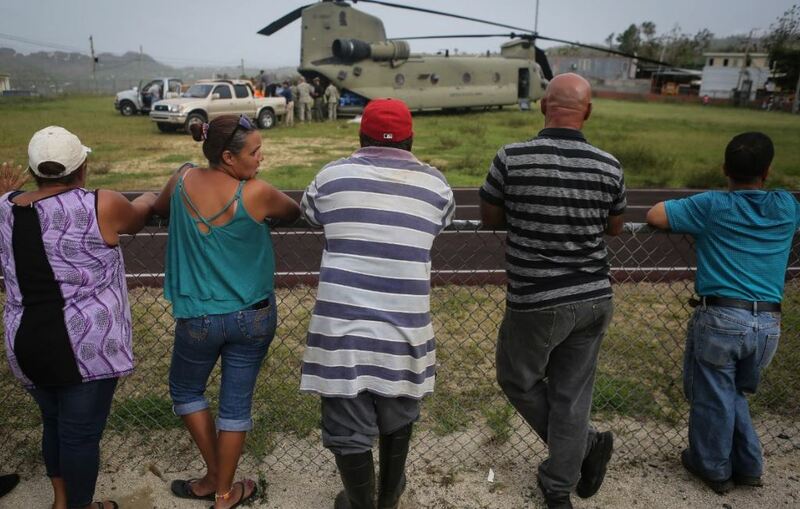 The Donald Trump administration’s response to the crisis reveals that Puerto Ricans are racialized as subordinate, despite their US citizenship. Trump’s racially charged statements resurrected long dormant, degrading characterizations of Puerto Ricans as lacking the capacity and will to fend for themselves. Maria has also exposed the crisis within Puerto Rico’s divided politics. The Statehood and Commonwealth parties have campaigned for decades on resolving Puerto Rico’s political status. Yet both parties share responsibility for the island’s escalating debt, and neither has been able to stop Puerto Rico’s economic decline. The entrenched poverty, crisis in political leadership, and the federal government’s continued treatment of Puerto Rico as “foreign to the United States in a domestic sense” have an uncanny resemblance to the situation in 1932. A major difference between now and than is that Puerto Rico is inconsequential for the preservation of US hegemony in the Southern hemisphere. With the dissolution of the Soviet Union and demise of Cuban influence, the US has no geopolitical rival in the Americas and Puerto Rico’s military value has disappeared. Moreover, decades ago Puerto Rico lost its privileged position as an internationally profitable offshore site for US manufacturing firms. By the mid-1970s labor intensive manufacturing had been displaced by capital intensive firms, including pharmaceuticals which eventually dominated the economy. These firms made a large percentage of their global profits in Puerto Rico through transfer pricing techniques, rather than through the actual value created by labor. In effect, Puerto Rican labor was a marginal and potentially expendable (labor was subject to displacement by robotics) component for wealth creation. Consequently, the historically unprecedented depopulation that started after the depression of 2006 and has accelerated since Hurricane Maria, should have little impact on economic growth. Unemployment remains at historically high levels despite the migration of close to half a million Puerto Ricans. Puerto Rico’s diminished role in the American empire explains Trump’s untroubled response to the economic and humanitarian crises that are consuming Puerto Rico. The irony, and the seeming mystery of the colonial economy, is that Puerto Rico is the United States’ fifth largest export market. A major difference, however, is that Puerto Rico does not figure as prominently in US national security as it did before the collapse of the Soviet Union and demise of Cuba as a regional threat. This partially explains the federal government’s seemingly untroubled response to the unfolding crisis in Puerto Rico. Another critical difference is that the Puerto Rican diaspora has emerged as a powerful, if unexpected, economic and political force. They have come to the aid of their island, and are actively lobbying against some of the most restrictive colonial policies — the Jones Act, PROMESA board, and inequity in federal programs. Puerto Ricans living across the United States are putting pressure on their local officials and the federal government for more assistance, and have organized a nationwide campaign to raise funding and collect donations for Puerto Rico. As a recent editorial in Puerto Rico’s leading newspaper put it, “the diaspora is key to the reconstruction of the country.” It may also be key in moving the federal government to finally resolve Puerto Rico’s political status. Republished from The Conversation . — The American reporter Elizabeth Knipple de Van Deusen commenting on the aftermath of the 1929 hurricane. Pedro Caban is a professor of Latin American, Caribbean, and US Latino studies at the University at Albany, State University of New York.